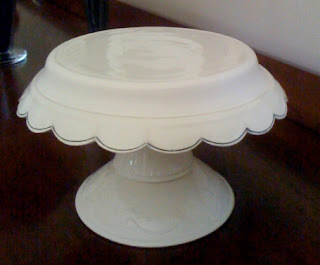 i just received an email from my mom that included pictures of the cake stands we are going to be using at our wedding! m and i decided a long time ago that the whole idea of a wedding cake was not for us, so when the time came to start planning our wedding we new all of our favorite cakes would be present. and by present we meant each one on their very own cake stand. or at lease i meant each one on their very own cake stand, i am pretty sure m would have been ok without the extra ceramic. it was one very cold winter day while i was sitting in front of my computer pouring over my new obsession - wedding blogs, style me pretty in particular. 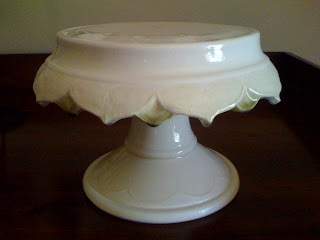 there was a post about clara french ceramics and their pretty pastel cake stands. i did a bit of research and found out that not only did they offer up their stands for rental as well as purchase, they were also more than willing to customize them for you. a new relationship blossomed with the lovely micaela, and today three of the most wonderful cake stands are sitting in my parent's dining room. i am more and more excited every day. we are working with a mostly whites and greys - a bit of olive green here and there are a very few bursts of black for contrast. 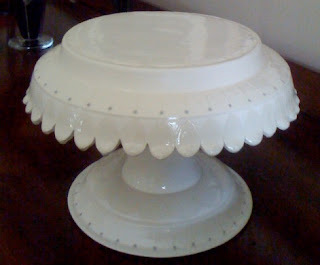 i think the cake stands are even more perfect than i originally anticipated ... and i had great expectations.